This is a true tale of American Heroism performed today by NoN other than my friend and roomie, Andrew Bain. You see, Our landLord threw out a bunch of stuff from the basement and onto the curb. This caused the trash collectors to avoid even our legitimate garbage for over a week. 2) Straightening out the piles. 3) Duct taping things together for easier pickup. 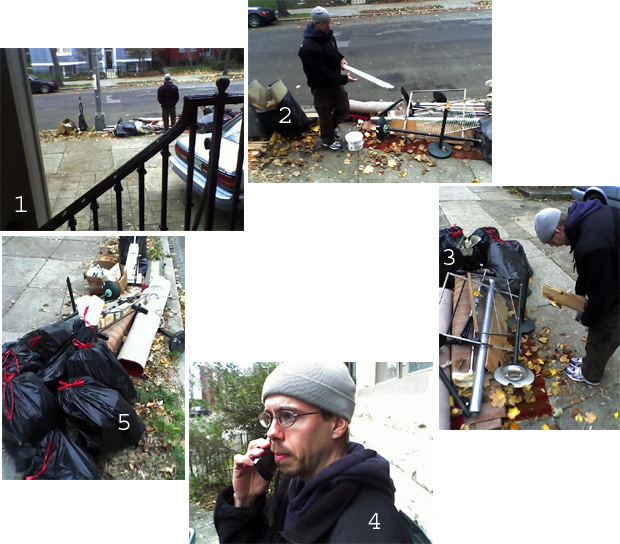 4) Calling the District trash collectors for "bulk" pickup. 5) A much neater and organized pile of trash.